Shi Xinning was born on 1969 in Liaoning Province, China. Trained in China, Shi Xinning’s paintings are influenced by both social realism and European styles. Using the authoritative qualities of both, Shi embarks on history painting with a twist. Taking his imagery from iconic press photos, Shi’s canvases faithfully represent the world as we know it, the Yalta Conference in familiar 40s sepia tone, the Queen Mum in carriage emblazoned in newspaper black and white. It’s only on second glance that Shi’s alterations become evident. Nestled between Churchill and FDR and conversing happily with royalty, Mao takes his place amongst the great leaders of the 20th century. In China-fying history, Shi investigates dynamics of both the west’s Eurocentric, and China’s isolationist past world views. 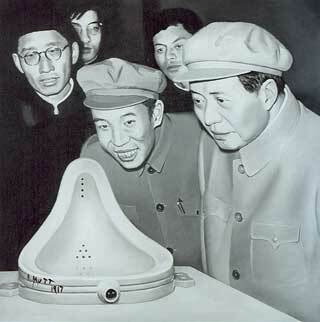 Humorously illustrating the Chairman’s import and omnipresence in 20th c Chinese society Shi’s insertion of Mao into the fabric of western collective conscience seems entirely plausible. Infusing the totems of propaganda currency with a sense of normality and humility, Shi re-authors the most cherished moments of collective memory with a ‘Forrest Gump’ effect, creating a specious mythology based in Hollywood schmaltz and unabashed optimism. Conclusions: Shi Xinning had already established his own style and the impact of the work had won him a strong reputation in Chinese art circles. View Shi Xinning paintings, biography, solo exhibitions, group exhibitions and resource of Shi Xinning. View art online at The Saatchi Gallery - London contemporary art gallery.